The best way to get to know a community is by scheduling a tour. See the facilities, meet the staff and residents, and get a feel first hand what it's like to live at Vineyard Place Memory Care. 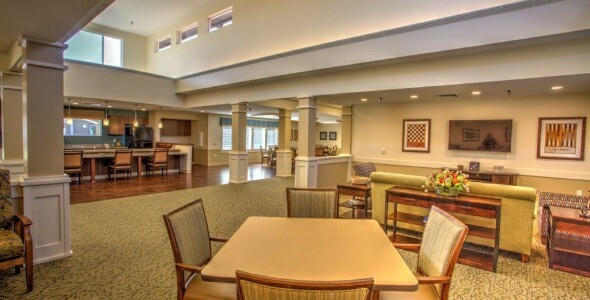 Vineyard Place, an Anthem Memory Care Community, is a licensed 82-bed memory care community, specifically designed to provide assisted living services to seniors with Alzheimer’s disease and other forms of dementia. Vineyard Place has two secure, garden courtyards where residents, families and guests can safely enjoy sunshine and the great outdoors, optimizing the day-to-day experiences of individuals with memory loss. Our person-centric approach is seen in every detail at Vineyard Place. The staff are hand-picked for their expertise, experience, dedication and compassionate. We are eager to meet you and ready to demonstrate our dedication to ensuring that your loved one is respected as a unique individual and cared for with excellent care and love. Fresh air, open spaces and plenty of sunshine play a large role in the unique architecture that are keep features of Vineyard Place. Designed with a figure-eight layout, the community design encourages a natural flow of movement, increasing the human touch points that are so important for individuals with Alzheimer’s and other forms of dementia. Each neighborhood is small enough to provide personal care and interaction, while the community as a whole provides for enhanced services and opportunities. Two-story vaulted ceilings with clerestory windows overlooking the lobby and resident neighborhoods ensure an abundance of natural light, which is highly beneficial for mood and energy levels. Vineyard Place provides a comprehensive set of amenities in areas of wellness, health and safety. Nursing and care staff are on-site seven days a week, providing each resident with customized service plan designed to exactly meet their unique needs. Meals are made from scratch and served family style in each of the two neighborhood dining areas. Family and friends are encouraged enjoy a meal and celebrate special occasions together here at the community. Secured exits and hourly safety checks allow residents freedom to move about at will, while protecting them from harm. We are committed to creating a safe, active, and friendly environment, to fulfilling our residents’ desire for understanding and significance, to pursuing personal and professional growth, and to providing peace of mind in everything we do. Thank you for your interest at Vineyard Place. Please give us a call to schedule a free tour.